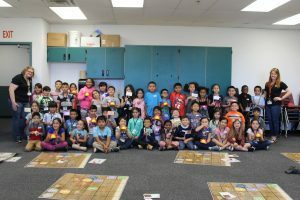 During the week of March 26-30th, Cyclone Space Mining (CSM) completed an outreach project called “Space Week” with Ocotillo Elementary School in Pheonix, Arizona. This project consisted of a week-long lesson plan involving coding, robotics, and STEM (Science, Engineering, Technology, and Math) activities. The week began with an introductory video telling the students who CSM is and what they do. 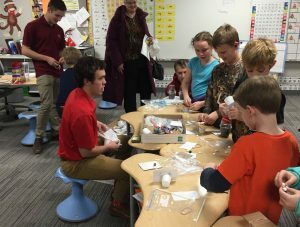 In the weeks leading up to this project, students at Ocotillio Elementry School came up with and sent questions to Iowa State University alumni and retired NASA astronaut Clayton Anderson. Clayton answered these questions in a video that was presented to the students during class. The former astronaut also signed four copies of his new children’s book, A is for Astronaut, which CSM sent to the school. During the second activity, students learned about computer programming. This involved activities such as “Computer Says”, a computer version of Simon Says, that helped to solidify that computers need input in order to function properly. Towards the end of this lesson, the students learned the basics of Bee-Bots, which they would use for their mission to Mars. CSM introduced the students to robotics during the third lesson. The students watched a video with interviews of Iowa State University professors talking about robotics. Then they learned about real-life applications of robotics, like the manufacturing robots at Quality Manufacturing Corporation in Urbandale, Iowa. After watching this video, the students were able to build and color their own paper robots. The final mission was to send a Bee-Bot to Mars! After watching a trailer for the mission, the students drove their Bee-Bot to the rocket on the launchpad, and then explored Mars. The students followed six guiding cards that gave them the instructions for their mission. 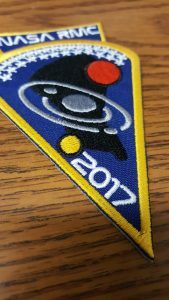 Once they had completed their mission on Mars, students planted their custom flag and received mission patches to celebrate their hard work. Cyclone Space Mining would like to thank Clayton Anderson, Quality Manufacturing Corporation in Urbandale, Jaeyoun Kim, and Soumik Sarkar for assisting us in making videos for this outreach project. 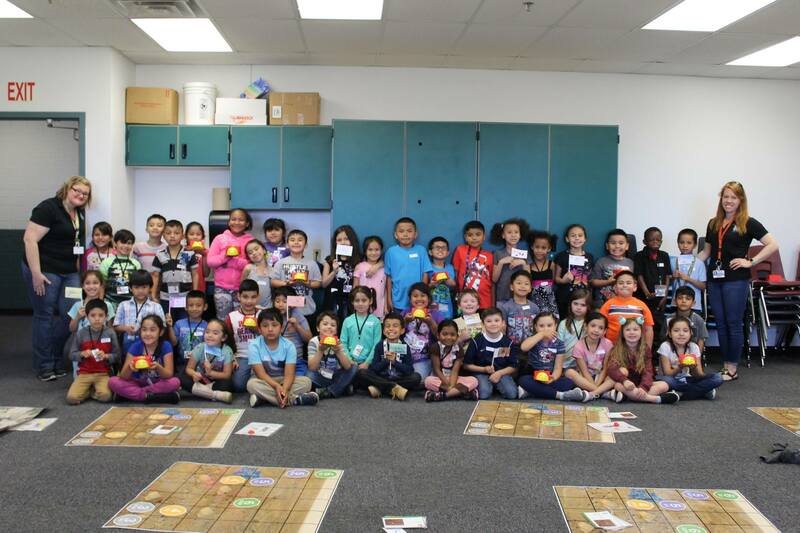 CSM also would like to thank the students and faculty of Ocotillio Elementry School for making this project happen! On February 3rd, Cyclone Space Mining (CSM) held a systems requirement review to clarify what was required for us to build a successful robot for competition. This was an overarching review, encompassing all of our subsystems and involved audience participation from every team member. The systems requirement review involves each subsystem team analyzing the NASA Robotic Mining Competition rules and rubrics for rules that apply to them. Based off of how these rules affected their subsystem, the teams then came up with additional requirements that they would need to meet for the robot to function correctly. Once they came up with their requirements, subsystem teams had to justify why they chose the requirement (NASA rule, necessary for function, etc.) and say how they will verify their requirement. The teams then took this information and presented them to the other subsystem teams and a judging panel. The audience (fellow CSM members) and the panel then offered improvements and changes to these requirements. Knowing your constraints is essential in designing and engineering anything from a mining robot to a paper clip. The systems requirements review allowed for us to know our constraints. Based off of this review, each team walked away with a better understanding of what is now required of them, allowing for them to adjust their designs based off of this information. Having the entire CSM team review each subsystem’s requirements allowed for each member to get a better understanding of the overall robot and where their subsystem will fit in. With the information gained at this review, subsystem teams will adjust their designs and begin testing if their designs meet their requirements. After more designing and testing is done, CSM will hold a preliminary design review to monitor the progress of each subsystem. 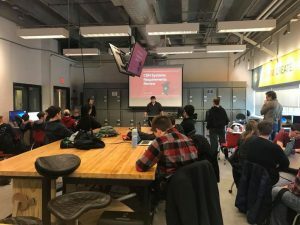 Based on this review, teams will make adjustments to their design before the critical design review, which will lockdown any lingering questions before the final build of the robot takes place. The Iowa Championships of First Lego Leauge (FLL) were held January 13th and 14th at Iowa State University. 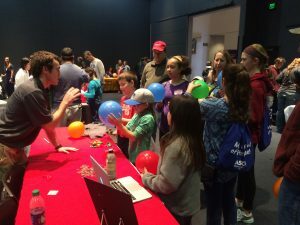 Held annually, the event is aimed at K-12 students interested in Science, Technology, Engineering, and Math (STEM). The students use Lego robotics to accomplish set tasks, and they’re judged base off of how well they complete these tasks. 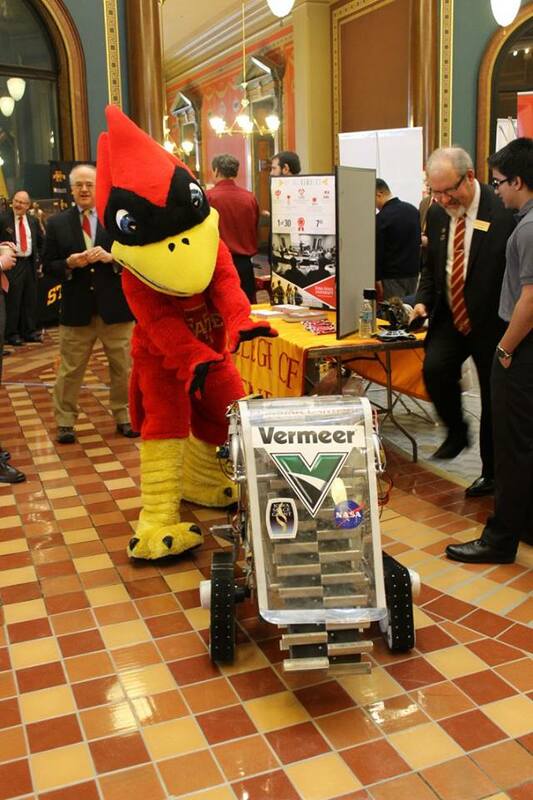 For Cyclone Space Mining (CSM), this was a great opportunity to reach out to young STEM minds. 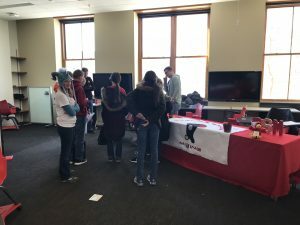 CSM achieved this by having members volunteer at the event and also having a booth to discuss our robots, college, and STEM with students and parents. Altogether, CSM contributed over ninety hours of volunteering to this event and spoke to nearly 600 people at our booth during both days of the event. It is always a joy to discuss our club with interested young-learners, and CSM looks forward to next years FLL competition. If you’re looking for a fun activity to interest young learners, the Lunar Lander Activity is a great choice. With just a few cheap building materials, you can stimulate your children’s/classrooms critical thinking skills, along with their imaginations. Recently we offered this activity at Edwards Elementary School’s Science Night. We went in with around 50 lunar lander kits and ended up needing to make more as the activity was so popular. The children who participated in the activity challenged themselves to make the best lander possible, and the creativity was truly ‘out of this world’. 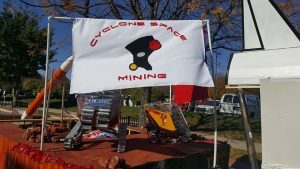 The Iowa State Cyclone Space Mining team works hard to provide a relationship between Robotics, Space, and Mining to the STEM fields. As a part of the NASA Outreach report, students made an illustration in the form of a circuit board to show the relationships. 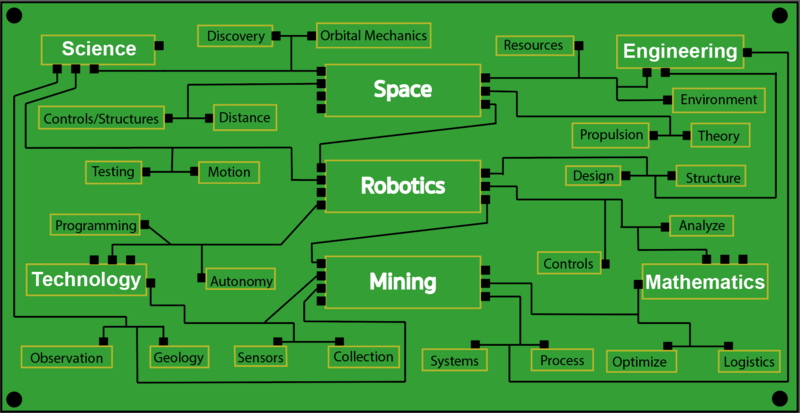 As seen in the illustration, the words form a complete circuit to ensure that each and every part of STEM plays an important role in the Robotic Space Mining application. This illustration shows an important part of outreach and how engaging students in one subject can lead to new and bright innovations relating to space mining. The outreach group of Cyclone Space Mining creates a hands on activity for each event and brings along a robot to show students around the community what they are capable of doing in a few years. Our team continues to extend our outreach around Iowa to ensure every child will have the opportunity to do what makes them happiest and try new things. Stay tuned for more outreach events throughout the 2017-2018 season! Learn more about the new 2017 Cyclone Space Mining robot duo, Space Ketchup and Space Mustard in the 2017 Systems Paper. 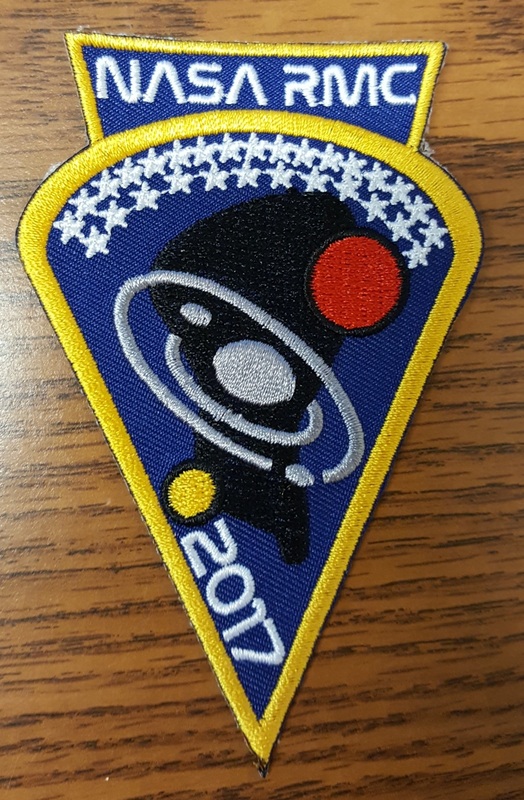 This year, in preparation for our journey to the NASA RMC, we designed Mission Patches, similar to those that NASA produces for the crew of each mission/expedition. 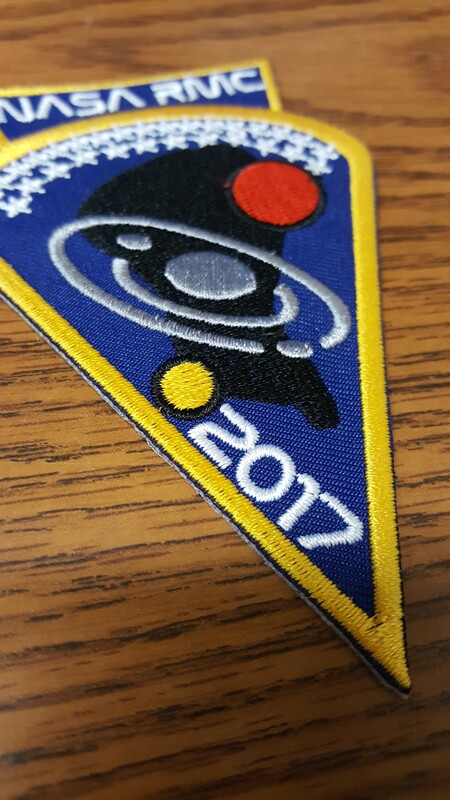 It is our sincere hope to continue this new tradition as part of Cyclone Space Mining for years to come. Centered on a blue field, is the symbol of Cyclone Space Mining; the Black Cyclone with 3 orbs. The blue field represents Earth; which we stand on to look out at other celestial bodies. The 3 orbs represent the Sun (gold) , Moon (silver), and Mars (red). From Earth we can see these 3 important celestial bodies. The sun which gives us light and energy; the Moon as our friendly neighbor and original mining and colonization goal, and lastly, Mars, our new mining and colonization target. The orbs of gold and red also represent Iowa State University as our school colors; cardinal and gold. The silver orb also serves as the center of a silver galaxy; as we look beyond our solar system and into the Milky Way for inhabitable planets to explore. 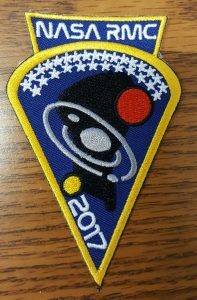 The shape of the patch is a downward facing arrow. The point facing downward represents the direction in which our robots are digging; down to the regolith. The gold rounded arch inside the arrow represents the horizon; as we are rising up to reach our boundaries, and surpass them. 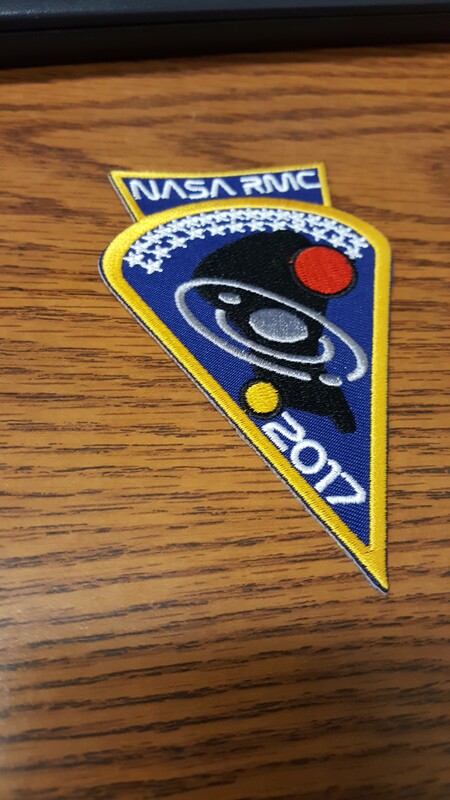 The flat base of the arrow is “NASA RMC”; the event which is the foundation of our organization; the reason we have come together to work. It is also above the horizon, as it is our final destination of the academic year; the culmination of our work. The 29 white stars represent Iowa, the 29th state to enter the Union. As part of our outreach program, the Science Center of Iowa located in Des Moines, IA asked us to present an activity to show the kids how space, robotics, and engineering play important roles in our club. We came with a very simple activity — balloons and pennies. Since every kid loves balloons (except the popping!) we had the kids put a single penny inside of a balloon. We then challenged the students to keep the penny moving after shaking and rotating the balloon as much as they needed. The balloons allowed for light to shine through, so the penny is easily visible. Once the girls got the penny spinning, we then explained to them how this worked. The penny wants to keep moving in a straight line, however the balloon is keeping it rotating in a circular motion. We could then scale this demonstration up and act as if the Sun was in the center of the balloon, and the penny was the Earth, orbiting around the sun. In addition to bringing the demonstration, we also brought our competition robot, along with a computer that played videos of our robot during competition. We reached about 300 students at this event, which shows how excited we are to help the younger generation get interested in science, engineering and space! We have formed a wonderful relationship with the Science Center and continue going to outreach events hosted by their program. 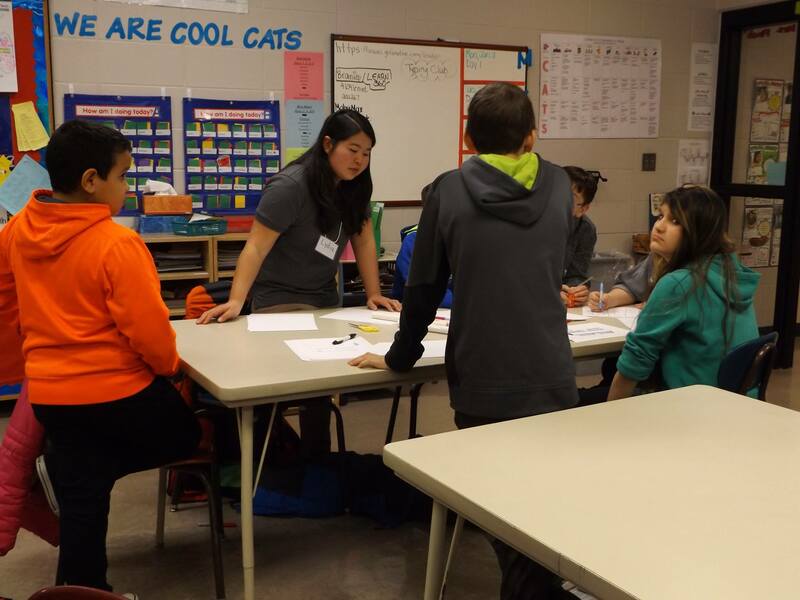 As part of Cyclone Space Mining’s outreach events, the team had the opportunity to spend three hours (two 1.5 hour sessions) with a group of fifth grade students at Lenihan Intermediate School. There were around 18 students and 4 club members attending the classroom sessions. The goal was to encourage students to get excited about STEM and work together as a team. At the sessions, students formed teams to design, build, and launch paper rockets. During the first session, Dan Miller and other club members talked about the importance of teamwork. In engineering around the world and especially at NASA, working on a team is the most effective way to build something really cool. The students went around the room and talked about their favorite teams and what made their team successful. This discussion set the tone for the rest of the lesson. Next, we taught the students about decision matrices. They made their own decision matrices later to decide how they would design their own rockets. The first session concluded with teams choosing names and writing the team name on their initial rocket. After the first session, it was very encouraging to see how excited the kids were for the next class! To begin the second session, the teams reconfigured and reviewed their decision matrices. The students tested their rockets and made adjustments to their rockets. In the last twenty minutes of the class, Cyclone Space Mining led the final launches on the paper rockets. The winning team launched their rocket 72 feet. The students were astounded with the improvements, beating their previous record of 40 feet. As the team was leaving, one of the students asked if we would be coming back next year and what activity we would be doing. The growing enthusiasm for STEM was apparent with each rocket launch. Engaging young minds is something we get to do all year, but this event was especially rewarding. Spending more time with kids and watching them learn over a couple weeks was an amazing experience. 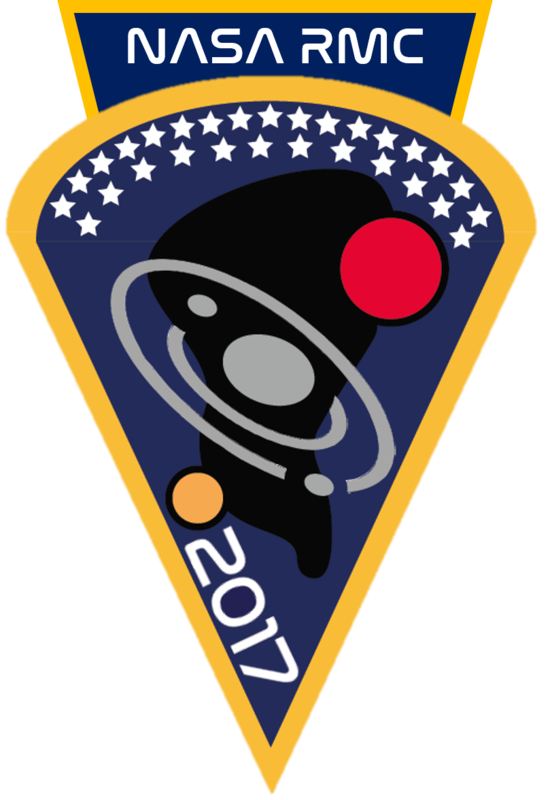 NASA, like all other organizations, has many departments that function individually to accomplish the overall mission of the organization. 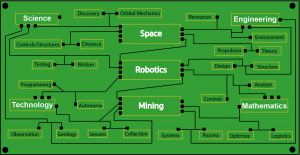 Similarly, Cyclone Space Mining has “departments” which focus on different areas of the NASA Robotic Mining Competition (RMC). While NASA has many, many more departments than our team will ever have; Cyclone Space Mining is set up to run as closely to NASA as we possibly can. Within our club we have R&D (Research and Development), Controls, Mechanical, Outreach, Public Relations, and Sponsorship teams. NASA also focuses on those areas, but on a much larger scale. Our R&D team’s main focus is to come up with new and innovative ideas for future RMCs. Currently, they are working are plans for the 2017 RMC with plans to look even farther into the future. NASA constantly is conducting research and development for future missions. The Controls and Mechanical teams work separately but communicate constantly to design and manufacture a robot that is able to operate autonomously. The project managers and the controls lead are essential to the success of the production of the robot. Without the leadership and communication between those individuals the robot would not run. Obviously, the designing and manufacturing of rovers, rockets, etc. requires hundreds of engineers of many different disciplines. 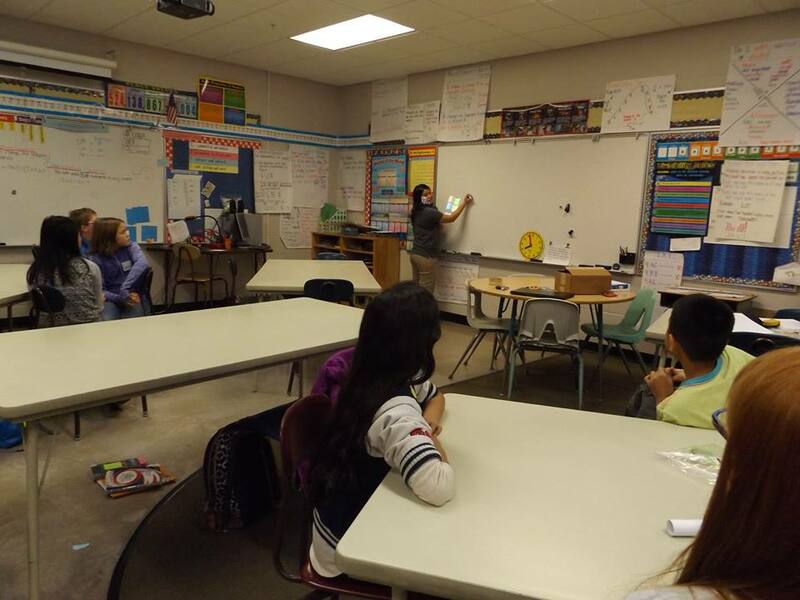 Outreach’s main goal is to promote STEM involvement in K-12 students. This year the outreach team has planned more than 30 individual events and reached at least 4,000 kids. NASA’s outreach has a much wider intended audience, and even includes our team. 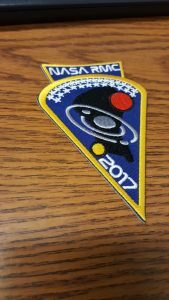 The NASA RMC is a huge outreach event which encourages college students to innovate and engineer. The Public Relations team within the club not only runs the teams social media but works with media outlets covering the club, designs promotional material for the organization, and creates a spirit plan for the competition. NASA has a very successful PR team which reaches out to media outlets, runs various social media outlets, and works to maintain their public image. Finally, our sponsorship team is very similar to the business component of NASA. The sponsorship team reaches out to various engineering companies for funding and materials. Having funding is essential to the success of the club. NASA also works with the government to receive funding. Both our team and NASA must show our sponsors (the government, in NASA’s case) what we are going to do with their funding. Modeling our team after NASA has greatly increased the productivity of our team. It also allows team members to diversify their portfolio by working on non-engineering parts of the club in addition to the engineering parts of the organization.